Tai Kwun is located on a historic site that dates back to the mid-19th century. It is therefore important to take appropriate measures to conserve this precious site. While Tai Kwun aims to provide the best environment for visitors to enjoy their experience of the heritage and arts offerings, visitor numbers must be carefully managed in order to minimise the impact on the site and on the neighbouring community. There is no admission fee to enter Tai Kwun. However, visitors are encouraged to get a Tai Kwun Pass which gives you guaranteed access to Tai Kwun and is essential during peak times. At off-peak times, a limited number of visitors will be able to enter without a Tai Kwun Pass. 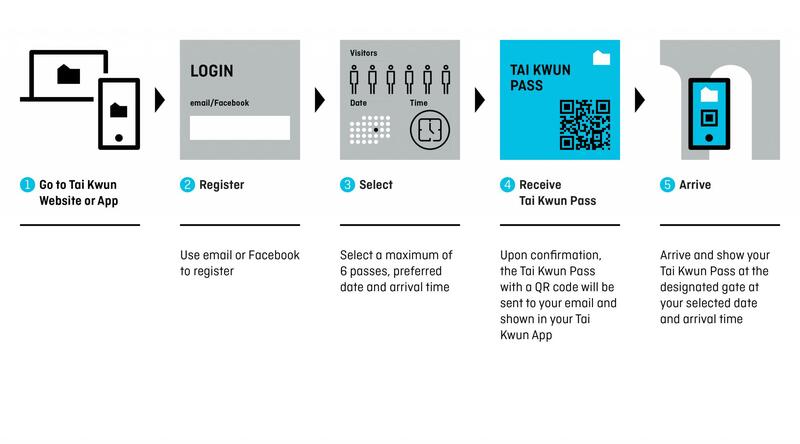 In just a few simple steps, visitors can get their Tai Kwun Pass! A Tai Kwun Pass may only be applied through a valid registered account on Tai Kwun’s official website or mobile application (the “Account”). Application for a Tai Kwun Pass is on a first come, first served basis. A valid soft or hard copy of the QR Code of the Tai Kwun Pass must be presented for admission into Tai Kwun and/or a specific programme, performance, exhibition or event (“Event”) on the selected date / time. JCCPS may set the maximum number of admissions into Tai Kwun and/or a specific Event that may be applied for under one Tai Kwun Pass. Exit from Tai Kwun and re-admission on the same day shall be regarded as a new and separate admission. No counterfeit Tai Kwun Pass will be accepted. Tai Kwun Pass may not be sold, exchanged for cash or any other goods, services and/or privileges, and/or refunded. No replacement Tai Kwun Pass will be issued if defaced, deleted or corrupted. JCCPS may at any time refuse admission into Tai Kwun without compensation or otherwise. JCCPS may at any time suspend or terminate the use of a Tai Kwun Pass without compensation or otherwise. JCCPS may revise these Terms and Conditions from time to time, without any prior notice. The Account holder and JCCPS agree and acknowledge that (1) they do not intend any term of these Terms and Conditions to be enforceable by any third party pursuant to the Contracts (Rights of Third Parties) Ordinance (Cap 623); and (2) these Terms and Conditions shall be excluded from the application of the Contracts (Rights of Third Parties) Ordinance. In the event of any dispute in connection with the Tai Kwun Pass, the decision of JCCPS shall be final, conclusive and binding. These Terms and Conditions are written in English and the Chinese translation is for reference only. In the event of any inconsistencies between the English and Chinese versions, the English version shall prevail.